There is some great architecture in Cairo, an Arab cultural center for centuries. 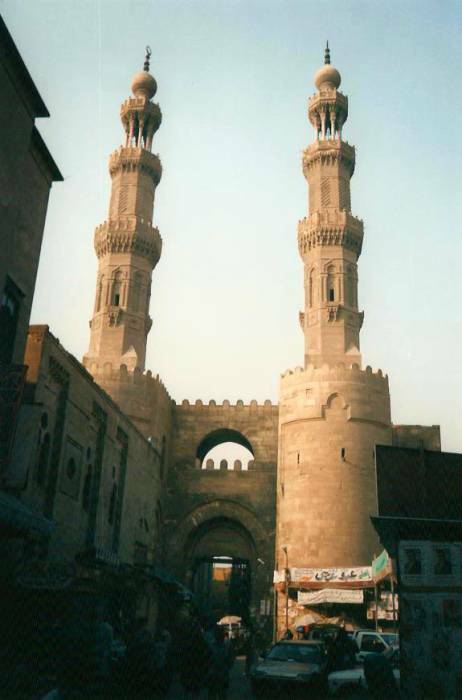 There are many Mamluk-style minarets and grand gates in the Old City. The Mamluks ruled 1250-1517 AD and they were generous patrons of architecture and art. Cairo was their capital and it became one of the wealthiest cities in the Near East and the center of artistic and intellectual activity. 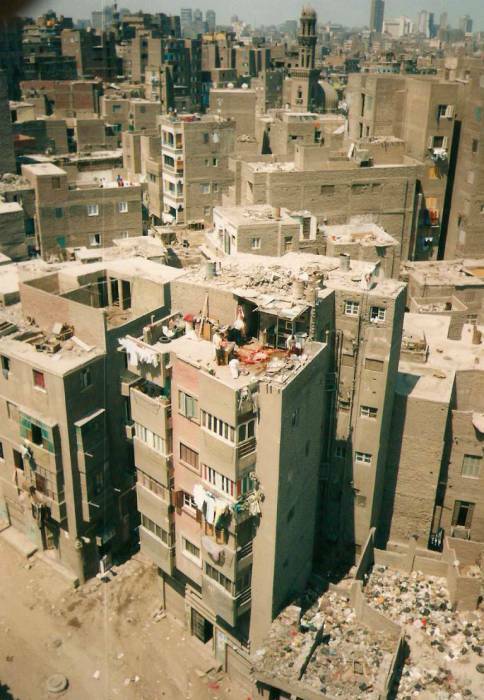 Ibn Khaldun called Cairo "the center of the universe and the garden of the world." Below is Bab Zuweila, the Zuweila Gate. Bab Zuweila is next to the Mosque of Sultan Mu'ayyad Sheikh. 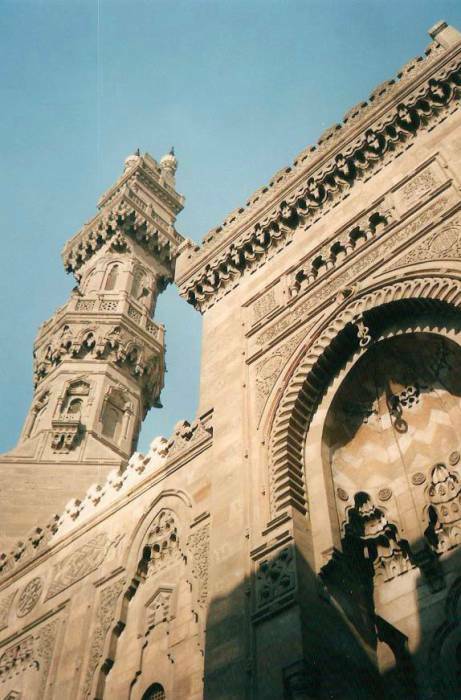 We will have a look inside the mosque and then climb one of the minarets for the great view over Cairo. Below is the view from one of those minarets of the Mosque of Sultan Mu'ayyad Sheikh. The mosque was built in 1416-1420 CE. The minarets are are built on top of the adjacent Bab Zuweila or Zuweila Gateway. There are great views from up on the minarets! Sultan Mu'ayyad Sheikh started his life as a Circassian slave. He rose through the ranks of the Mamluk rulers and eventually became the Sultan of Egypt. This is the Ibn Tulum Mosque, one of the largest mosques in the world. 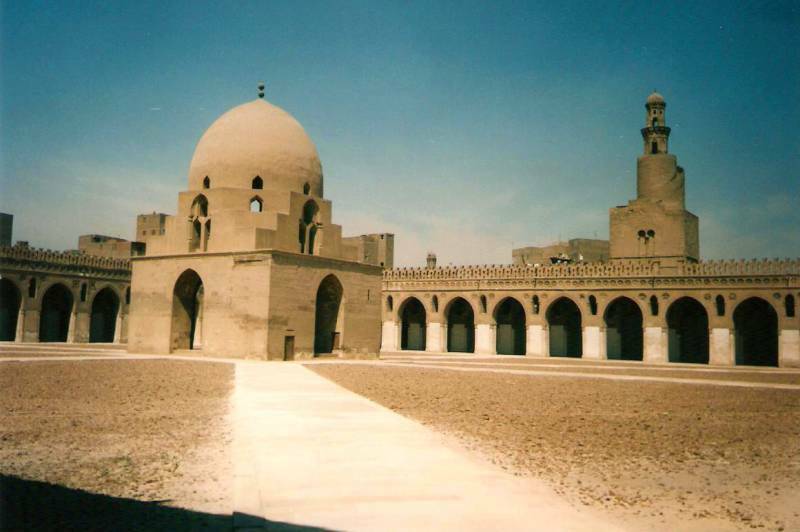 The Abbassid caliph of Baghdad sent Ibn Tulun to rule Cairo, he had the mosque built in 876 CE. The inner courtyard was designed to house his army and its horses. Notice the large minaret with exterior spiral staircase. 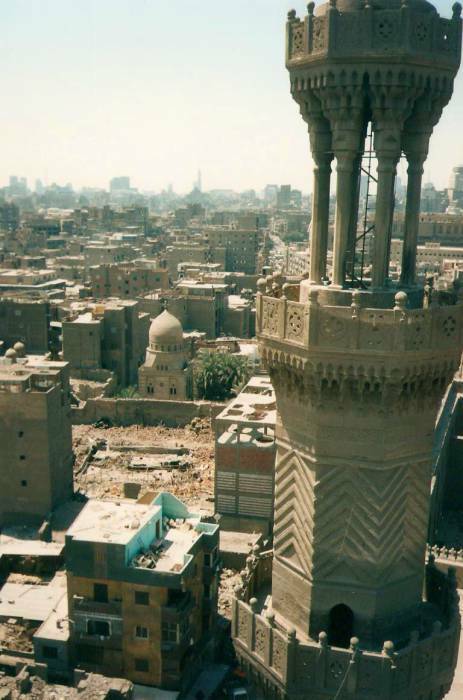 For just a little baksheesh you can climb the minaret and have a great view over Old Cairo. Below is a view from the top of that minaret above the Ibn Tulum Mosque looking down across the neighborhood. Notice the large pool of blood on the roof of that five-story apartment building. I was in Cairo during Eid al-Adha, the feast at the end of the hajj. A group of men led a full-sized cow down the street into this neighborhood and into the building. Cairo is the sort of large city where you can lead a cow down the street and into your apartment building with no one raising an eyebrow. After much clattering and much mooing, they eventually emerged on the roof with the cow. For some reason they had decided that the roof would be a good place to butcher a cow and then leave most of the blood pooled there in the sun. Wealthier families, able to afford a larger sacrifice, share the meat with the less fortunate — this is one of the pillars of Islam. 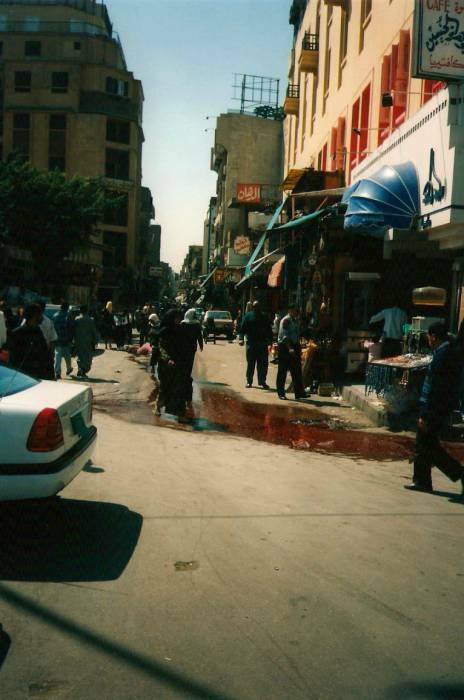 Speaking of the Eid, the above blood-filled street scene is on a major street near Midan Hussein, in the Khan al-Khalili bazaar area. Maybe you've heard the expression, "The streets will run with blood." 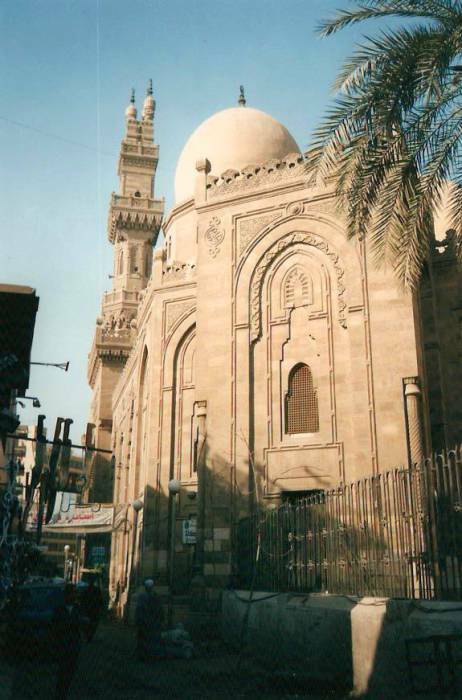 This is the Al-Muallaqa Church, in the Coptic district of Cairo south of Midan Tahrir near the Nile. 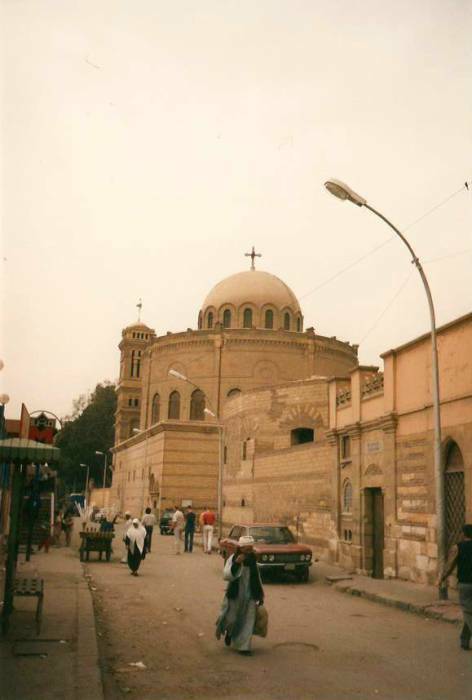 It's one of the oldest Christian churches in Egypt. Speaking of Midan Tahrir or Tahrir Square, that's it above. 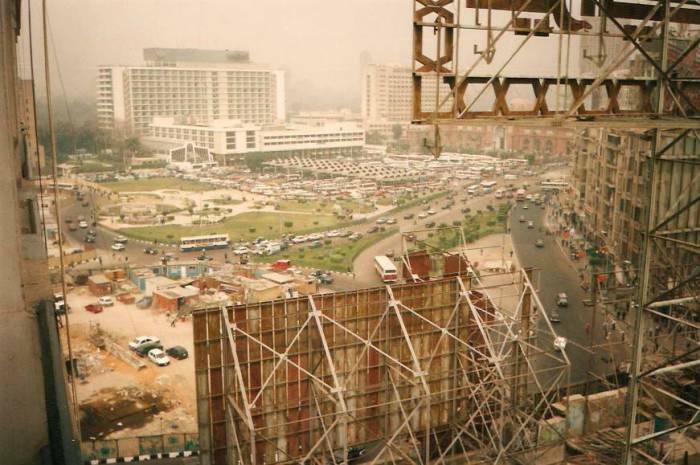 This is the large big square in central Cairo next to the Nile. This is big square that became famous during the 2011 unrest leading to the fall of long-time ruler and "Modern Pharoah" Hosni Mubarak. The Cairo Museum is just north of here. Most of the south side is the Soviet-scale Office of Government Bureaucracy, or whatever they call the place where you go to get your visa validated. 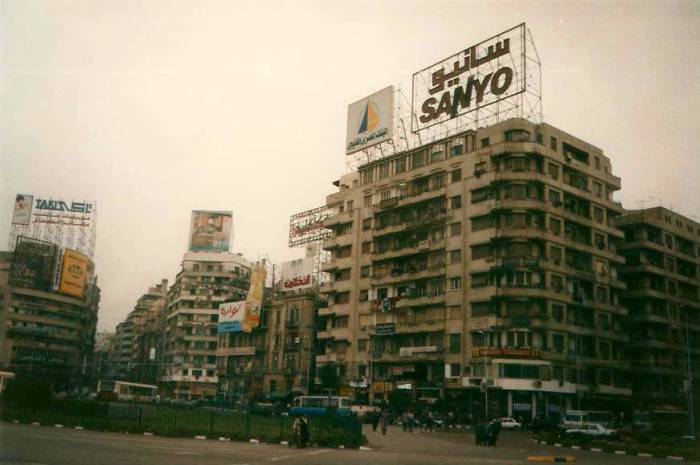 I stayed at the Hotel Ismailia right on Tahrir Square, up on the 8th floor of that apartment building with the Sanyo sign. 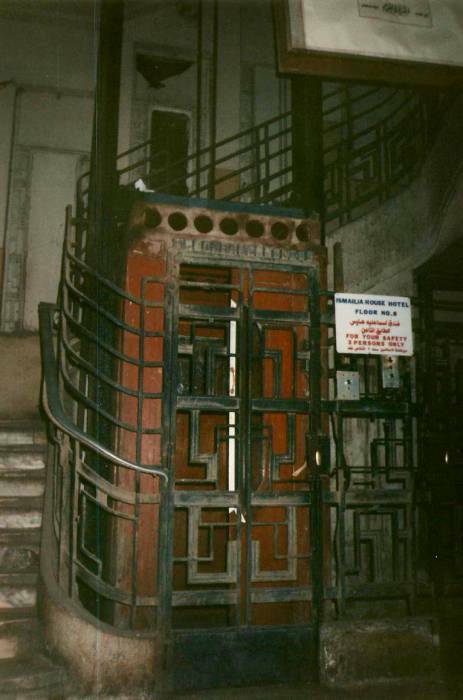 Below is the building's entrance, between a couple of little restaurants. You go past the Restaurant Z and into that passageway, and then ride the elevator up to the 8th floor. 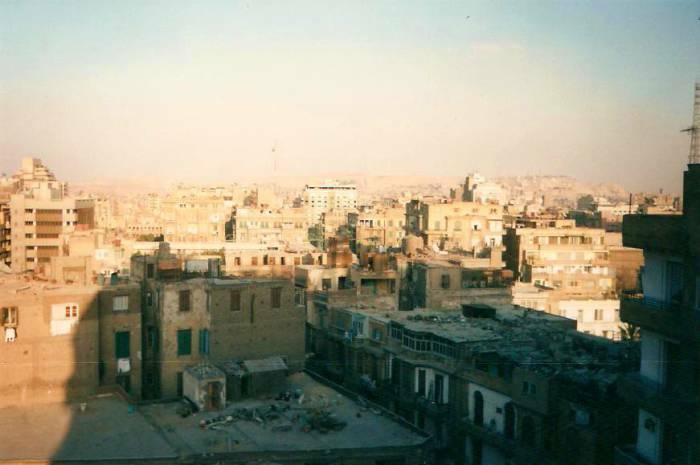 About 20 E£ (US$ 12) for a double room with a balcony overlooking old Cairo. Phone +20-02-356-3122. 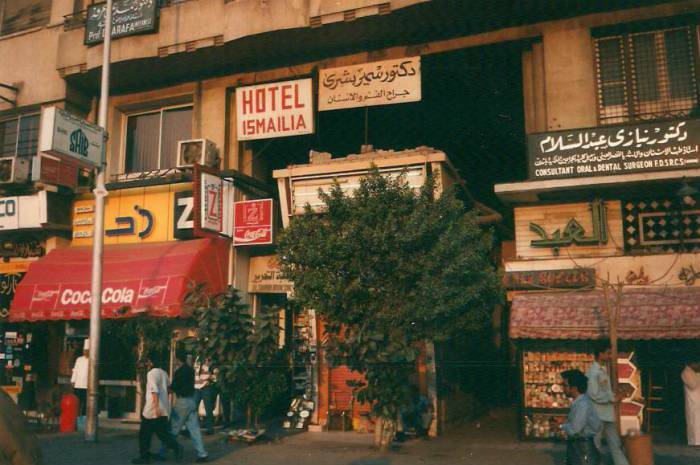 A minibus from the airport is 25 piastres, and the bus and train stations are within walking distance of Midan Tahrir. The first picture below is the view down over Midan Tahrir from my room. The haze in the air is the tail end of a sand storm that blew in out of the desert for much of that afternoon. And this is the view the other way from the hotel room window, looking out over Old Cairo. 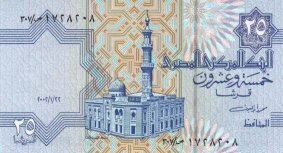 Egyptian 25 piastre note, a quarter of an Egyptian Pound and less baksheesh than commonly wanted, but it's good to keep a fistful of piastres handy. Of course it says ٢٥, those are the actual Arabic numerals for 25! Yes, baksheesh. Baksheesh makes the world go round, and Egypt seems to have a largely baksheesh-based economy. But what is baksheesh? The Arabic word baksheesh classically refers to a tip, a gift, or a payment for services rendered. However, in today's Egypt baksheesh is the word you hear more than any other word. Some locals chant it endlessly at foreign visitors. — Hey! Give me money! Vagrants camp out in museums and historic sites, wheedling endlessly for baksheesh. Visit a museum in Cairo and some old guy will scurry around ahead of you switching out the lights in the display cases. When you try to look at something he turns the light on briefly, then turns it out and says "Baksheesh!"